Crooked Letter, Crooked Letter by Tom Franklin is a mystery, but definitely not a thriller. It's much quieter than that. Much more literary. I found the story to be compelling and the characters to be interesting, but the way the novel was written just didn’t pull me in as much as I had expected. It was well-written, but perhaps the style of writing didn’t work for me. Or maybe it was the pace. It’s funny because within the first couple of chapters, a person is shot, a dead body is found and we learn of two different missing girls. This seems like a strong beginning, but it isn’t as exciting as it sounds. There was more description of these events than action. There was also a lot of reflection on the part of the characters, which is nice, but it can slow things down a bit. With all that said, when I sit back and think of this novel as a whole, I really did enjoy it. I'm glad I read it. And I am still contemplating adding it to my list of options for my book club. I think there are several interesting topics to discuss: racism in the south, family issues and bullying to name a few. I just think it was a bit slower than I had expected, and didn’t have quite the impact I thought it might have since so many people had recommended it. 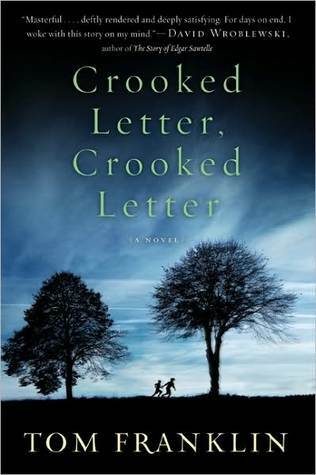 This review was written based on a copy of Crooked Letter, Crooked Letter that I purchased. I've been thinking about reading this one! I'm a little surprised that I loved this one as much as I did, because I expected a true mystery/thriller, and like you pointed out, it was much more than that. Definitely more character driven. I tired to read this but it just didn't grab me. i wasn't sure if i needed to give it some more pages or what but it was so easy to put down. i may try once again. Sometimes..the quiet and slowly paced ones can creep up and make one like them! I love all of Tom Franklin's work. The characters are real and you will end up caring deeply about them. I could not read it fast enough to see how it ended and I do not say that about many books at all. A very good use of your time.